Is the Earth the right model and the only universal key to understand habitability, the origin and maintenance of life? Are we able to detect life elsewhere in the universe by the existing techniques and by the upcoming space missions? This book tries to give answers by focusing on environmental properties, which are playing a major role in influencing planetary surfaces or the interior of planets… and satellites. 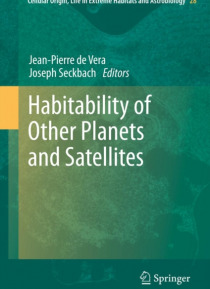 The book gives insights into the nature of planets or satellites and their potential to harbor life. Different scientific disciplines are searching for the clues to classify planetary bodies as a habitable object and what kind of instruments and what kind of space exploration missions are necessary to detect life. Results from model calculations, field studies and from laboratory studies in planetary simulation facilities will help to elucidate if some of the planets and satellites in our solar system as well as in extra-solar systems are potentially habitable for life.